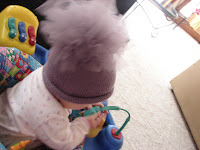 Here is a better photo of tulle-ing around. If you want all the juicy details, they can be fournd here. 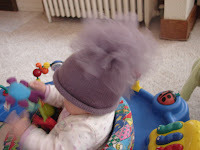 Here is a cute little hat I knit for Bean. What a fun project. It has all the ingredients to make for a quick, adorable project. Obviously, Bean wouldn't hold still to get a clear, crisp photo. So we take what we can get. Details incase you want to make one too. 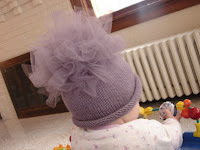 The pattern is from Susan B. Anderson's Itty-Bitty Hats, called Simple Baby Cap 1. I followed the directions to add the tulle, though next time I will shorten the tulle length's from 20 inches to 10 or 15 inches. 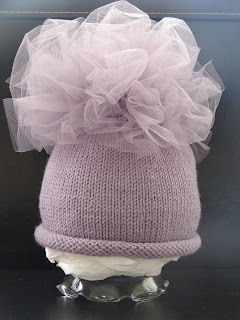 I used Debbie Bliss' Baby Cashmerino in lavender. Can you believe I found tulle that matches perfectly? !